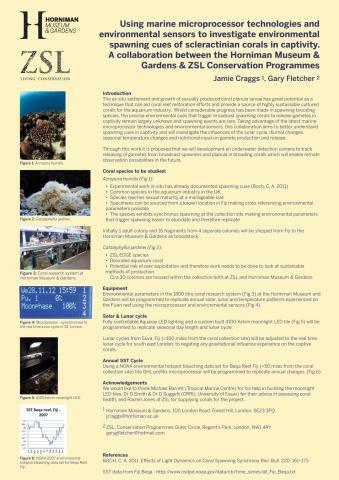 This is one of a series of projects I entered an abstract and poster for at the Reef Conservation UK Conference this year, I’m very excited to have the opportunity to work on this project. The ex-situ settlement and growth of sexually produced coral planula larvae has great potential as a technique that can aid coral reef restoration efforts and provide a supply of highly sustainable cultured corals for the aquarium industry. The precise environmental cues that trigger corals to spawn in captivity however remain largely unknown. Taking advantage of the latest marine microprocessor technologies and environmental sensors, this investigation aims to better understand these spawning cues in captivity and will investigate the influences of the lunar cycle, diurnal changes, seasonal temperature changes and nutritional input on gamete production and release. Through this work it is proposed the development of an underwater detection camera to track releasing of gametes from broadcast spawners and planula in brooding corals enabling remote observation possibilities in the future. This entry was posted in Aquaria, Horniman Museum and tagged Aquaria, Horniman Museam, London Zoo, zsl.